Early science activities, games, a new rhyme, circle time ideas, and simple crafts are just a few of the train-themed suggestions in this theme. Educa-chat, word flashcards, activity sheets, a picture clue story, coloring pages, and so much more to help you stay on track for learning fun! 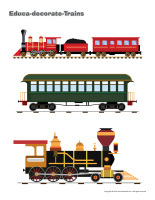 (Open thematic poster-Trains) Print and display within your daycare to present the theme to your group (and parents). 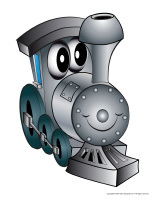 (Open educa-chat-Trains) (Open giant word flashcards-Trains) Print the questions and the giant word flashcards. Laminate them. Insert the questions in a box so that children can take turns picking one. Spread the word flashcards out on the table or display them on a wall. Print the “It’s my turn” card. Laminate it and glue it on a stick. It will help children respect the child whose turn it is to speak. You can also use your Poni puppet or a stuffed animal related to the theme. The questions will help children develop their observation skills, their ability to cooperate, their thinking skills, and waiting for their turn. This tool is a great way to animate circle time and explore your theme. I am at the front of the train. Who am I? I transport merchandise or people. Who am I? I am a train’s road. Who am I? I am where people board the train. Who am I? You need me to find your seat in the train. Who am I? I warn people that a train is coming. Who am I? You can see me where a railroad crosses a road. Who am I? I make sure cars cannot pass. Who am I? I am considered the grandfather of trains. Who am I? I drive the train. Who am I? You can find me under the ground in Montreal and other large cities. Who am I? People use me to wait for a train outside. Who am I? Add tasks to encourage children to tackle new challenges. (Open the task train) Print, laminate, and cut out. Display the train at children’s level, in your circle time area. Invite children to stand single file, holding the waist of the child in front of them as they move towards the task train. 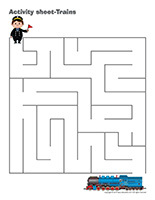 If you wish, you may add a few obstacles that children will have to avoid without breaking up the “train”, for example cushions on the floor. 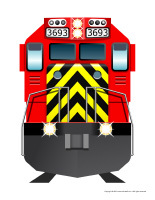 (Open educa-decorate-Trains) Print, laminate, and cut out the illustrations. Use them to decorate your walls and set the mood for the theme. 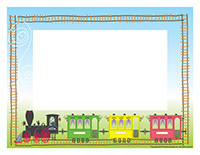 (Open garland-Trains) Print and let children decorate the garland elements. Cut out the items and use them to create a garland that can be hung near your daycare entrance or within your daycare. (Open educa-decorate-Means of transportation) Print, laminate, and cut out the illustrations. Use them to decorate your walls and set the mood for the theme. (Open garland-Means of transportation) Print and let children decorate the garland elements. Cut out the items and use them to create a garland that can be hung near your daycare entrance or within your daycare. The pictures may be used as a memory game or to spark a conversation with the group. Use them to decorate the daycare or a specific thematic corner. 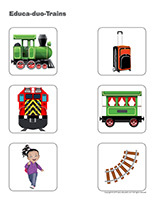 (Open picture game-Trains) Print, laminate, and store in a “Ziploc” bag or in your thematic bins. (Open writing activities-T like train) Print for each child or laminate for use with a dry-erase marker. 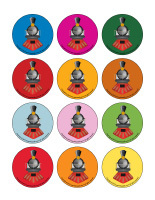 (Open educa-nuudles-Trains) Print for each child. Have children color the sheet and use Magic Nuudles to give it a three-dimensional look. Variation: You don’t have Magic Nuudles? Have children fill the spaces designed for Magic Nuudles with bingo markers or stickers. To order Magic Nuudles. (Open stationery-Trains) Print. Use the stationery to communicate with parents, in your writing area, or to identify your thematic bins. (Open scene-train station) Print, laminate, and cut out the pieces. Children use them to decorate the scene. (Open picture clue story-At the train station) Print. Sit in a circle with your group. Begin reading the story. Every time you reach a picture clue, pause to give children the chance to identify the missing word. (Open game-This is my spot-Trains) Print each illustration twice. Stick one copy of each picture on the table using adhesive paper. Deposit the second copy of each illustration in a bag and have children take turns picking a card to determine where they are to sit at the table, their spot in the task train, etc. 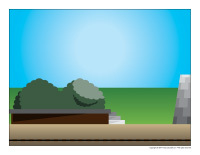 (Open my railway path) Print, laminate, and stick the illustrations on the floor to create a path leading to different areas within your daycare that children visit every day such as the bathroom, the cloakroom, etc. If you prefer, use the illustrations to delimit workshops. Have children stand single file behind you and invite them to place their hands around the waist of the child in front of them. Walk around your daycare, making train sounds. Stop in different areas and invite children to explore for a few minutes before taking off again. Use this activity to inform children about the areas they may and may not have access to. For this activity, you will need a baseball cap (train conductor) and tickets or boarding passes. You can simply cut rectangles out of construction paper and draw a simple train shape on each one. The conductor wears the hat and the other children (the passengers) stand in line behind him or her. They must follow his or her every move. Set up an obstacle course that includes balance beams, tunnels, lines drawn on the floor, cones, etc. Children stand single file, holding the child in front of them by the waist, and complete the obstacle course this way. Arrange several chairs one behind the other to form a train. Write numbers on small pieces of cardboard, creating two identical series. Use adhesive tape to press the first series of numbers on the chairs and deposit the numbers from the second series in a bag or basket. Children take turns picking a number to find their seat. 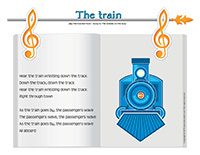 Once everyone has boarded the train, sing a train-themed song or simply make train-like movements with your arms and train sounds with your mouth. Have children stand on a line, at one end of your yard. Invite them to suggest different means of transportation. For example, if a child says “airplane”, children must take a few steps forward, holding their arms out to their sides to represent the wings of an airplane. If a child says “train”, they must make train sounds and move their arms to represent a train as they take a few steps forward. (Open giant tic-tac-toe) (Open tic-tac-toe-train & boat) Draw a tic-tac-toe grid on a large piece of white cardboard. 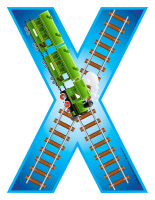 The trains will represent X’s and the boats will represent O’s. Give one player the trains and another player the boats. Children take turns setting a train or boat on the grid. The first child who places three identical symbols in a row (up, down, or diagonally) wins. Invite children to use their mouth to represent the sounds a train, a boat, an airplane, a truck, and a car make. You may also have them reproduce sirens. What is this means of transportation? Have children listen to different sounds associated with various means of transportation. Can they identify them? You may choose to provide illustrations representing the different means of transportation to help children associate them with the sounds. (Open color by number-Trains) Print for each child. Children must color the picture according to the color code. (Open educa-duo-Trains) Print and laminate for durable, eco-friendly use. Children must use a dry-erase marker to draw a line between items that go together. (Open educ-pairs-Trains) Print. Children must color identical illustrations using the same color or draw a line between both items. For durable, eco-friendly use, laminate the sheet for use with dry-erase markers. 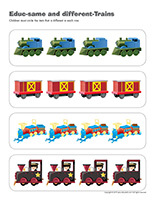 (Open educ-trace-Trains) Print for each child. Children must trace the lines with the correct colors and then color the corresponding items using the same colors. 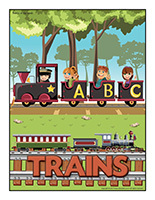 (Open educ-same and different-Trains) Print and laminate for durable, eco-friendly use. Children must circle the illustration that is different in each row. (Open educ-same and different-Means of transportation) Print and laminate for durable, eco-friendly use. Children must circle the illustration that is different in each row. 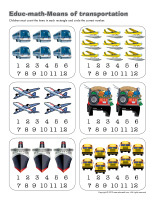 (Open educ-math-Means of transportation) Print and laminate for durable, eco-friendly use. Children must count the items in each rectangle and circle the correct number. (Open educ-shadows-Means of transportation) Print and laminate for durable, eco-friendly use. Children must draw a line between each item on the left and the corresponding shadow on the right using a dry-erase marker. For this activity, you will need a small plastic bottle for each child. Attach a string around the neck of each bottle to create necklaces children can wear. Show them how they can blow into their bottle to produce a sound that is a lot like a train whistle. Of course, children will need practice. That is precisely what makes this activity fun. Variation: You can pour a little water in the bottles to create different sounds. A long time ago, coal was used to fuel and propel trains. Purchase barbecue coals. Have children wear gloves and let them manipulate the coals. They can use them to draw on paper. For a very long time, trains were propelled by steam. Use an electrical kettle to help children understand steam. Have childlren blow on a mirror or a window to provide them with the opportunity to experiment it. You will need rectangular crackers (or Graham crackers), cream cheese, and Cheerios cereal to represent train cars as well as a locomotive. Once your snack train is ready to transport merchandise, provide a variety of snack items (miniature marshmallows, Gold Fish crackers, baby carrots, cheese bites, etc.). Children can use them to fill their snack train. (Open puppets-Trains) Print the various models on heavy paper. Have children cut them out and decorate them with arts & crafts materials. Glue a Popsicle stick behind each character to complete the puppets. 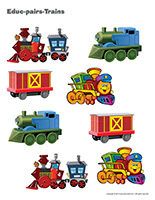 (Open models-Trains) Print the various models and use them for your crafts and activities throughout the theme. Purchase several inexpensive trains sets. Set a large paper banner on a table and invite children to press the trains’ wheels in poster paint before rolling them along the banner. If you wish, diluting the paint somewhat with water will make this activity easier. (Open educa-shapes-Trains) Print several copies and set them on a table. To begin, encourage children to color the shapes. When they are done, they can cut them out and glue them on a large piece of cardboard to represent a train. Show them how they can glue a square on top of a rectangle to represent the locomotive. The circles can be used to add wheels and an upside down triangle on the top of the locomotive can become a chimney. Another triangle on the front of the locomotive can represent a light. This activity can be done individually, but it can also be a wonderful group project. Let children get creative and add interesting details. For each child, you will need an empty toilet paper roll and a rubber band. You will also need waxed paper and a hole-punch. To begin, have children decorate their cardboard tube. They can paint it or use markers to draw on it. Once this is done, use the hole-punch to make a hole about 2 cm from the bottom of their cardboard tube. Cut a piece of waxed paper big enough to cover the end of each child’s tube and help them slide the rubber band over the waxed paper to hold it in place, on the tube. Children will love blowing in their tube to produce a train whistle sound. Give each child an empty tissue box. Each box will become a train car. Invite children to decorate their wagon with a variety of arts & crafts materials. If you wish, pick a theme such as zoo animals. Together, create a locomotive and use pipe cleaners to tie all the train cars behind it. 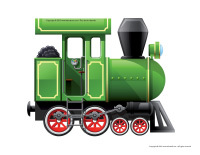 (Open coloring pages theme-Trains) Print for each child. (Open songs & rhymes-Trains) Print.